Muhammad Shujaat Siddiqi: Enterprise Library 6 is out! Enterprise Library provides an excellent way to keep the cross-cutting concerns outside your main application code. 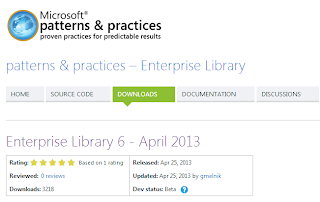 Microsoft Pattern & Practices team released new version of Enterprise Library last week. This was released on 25th April and this is Version 6 of the library. Full version of the library and source code can be downloaded from Microsoft's Download Center. The documentation can be downloaded directly form Pattern & Practices team's codeplex page. The documentation is still in preview version and is not updated on MSDN. Still this can be downloaded from the main page. 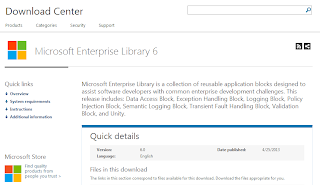 In addition to the Enterprise Library documentation, it also includes the migration guide for migrating applications from Enterprise Library 5. You can also find the reference PDF for Unity Application Block version 3 which is provided as part of the new version of Enterprise Library. The library seems to be released with exciting new features in existing application block. It includes a new application block with the name Semantic Logging Application Block. Transient Fault Handling application Block seems to have been added from Azure Integration Pack for Enterprise Library 5. Enterprise Library 6 includes the following application blocks. As discussed above, Semantic Application Block is the newest in the list. This is supposed to be built on top of EventSource provided in .net framework 4.5 for structured logging. EventSource provides structured logging support for ETW events. Semantic Application Block is supposed to add support structured logging by specializing EventSource, where the logs can be sinked to Azure or SQL Server database. Back in 2010, we did discuss about how we can use Validation Application Block in an MVVM based application. The release also includes a new version of unity application block. This is version 3 of Unity. As we know Unity provides the support of Dependency Injection for .net applications. This is a container based approach to Inversion of Control. Unity 3 extends Dependency Injection Windows store Apps and deeper integration with ASP.net MVC and Web API. Enterprise Library 6 only works with .net framework 4.5 and .net for Windows Store Apps (for Unity and Transient fault handling application block. It cannot be used side by side with existing Enterprise Library 5 binaries. If you are still on .net framework 4.0, you will need to make a decision about migrating to .net framework 4.5 first before moving to the new version of the enterprise library. This is the view of the release from top. There are other minor improvements and updates which require more detailed discussions. I am planning a few posts about the updates in Enterprise Library 6. You might find me blogging about them next month. You can find release notes here.